Three Ospreys still present today, with a fourth joining them this evening. Remarkable. More information and photos of the Ospreys can be found at Blagdon Lake Birds. A female Marsh Harrier was seen on Moreton Bank; nearby were 24 Meadow Pipits and a Wheatear. A bit more migration happening today. One of the Blagdon Ospreys was seen again at Herriott's Pool and Moreton today. A Marsh Harrier was watched flying north up the East Shore at 08:30, 40+ Sand Martins were seen, 12 Chiffchaffs aroound the lake and a Wheatear was seen in Heron's Green. Four Little Gulls were in the Denny/Hollow Brook area. An Osprey was seen at Herriott's Pool this afternoon. 20 Sand Martins also still there. Two or three Ospreys still present today. An adult Little Gull was watched at close range in Heron's Green Bay this afternoon; other birds seen today were 29 Sand Martins, 6 Chiffchaffs (including a grey 'tristis' type), a Peregrine, and an Osprey, visiting from Blagdon. Three Ospreys today was, as far as I know, a record count for the lakes. It's not often you get to see a Little Gull as close as this at Chew (Sean Davies). Two Mediterranean Gulls in the roost tonight, and superb views of a hunting Barn Owl hanging in the wind 10m in front of Nunnery hide. Some decent weekend coverage again in continuing bitter weather gave little reward: one Egyptian Goose, 160 Goldeneye, nine Goosander, seven Wigeon, three Greater Scaup, 40-50 Sand Martins, three Bramblings (Nunnery again), two Green Sandpipers, two Snipe, at least 12 Chiffchaffs, one Barn Owl and one Mediterranean Gull. An Osprey was seen flying over Heron's Green Bay this afternoon. Ten Sand Martins battling the icy wind at Herriott's Bridge this afternoon. At least 12 Bramblings were seen high in the trees at Nunnery Point this afternoon; they seem to take to the treetops around Chew at this time of year. Check Moreton and No. 2 picnic site for them as well. Four Mediterranean Gulls and a Sand Martin were also seen. 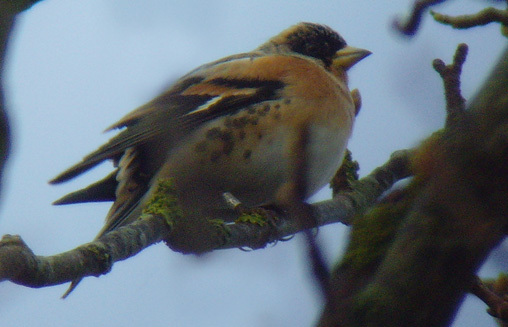 Male Brambling at Nunnery Point. (Chris Stone). Two Barn Owls (Moreton Bank field and Parkland) were seen tonight, along with two Greater Scaup and four Mediterranean Gulls in the roost. A second-winter Iceland Gull was a nice find in the roost tonight. Four Mediterranean Gulls were also seen there. Also today - three Greater Scaup, male Red-breasted Merganser, three Little Egrets and one each of Redshank, Common Scoter and Curlew. Some decent coverage and decent list of birds seen at the lake on a dreary March day: the male Common Scoter off Denny still, four Wigeon, two Chiffchaffs, c.20 Siskins, two Redpolls, two male Greater Scaup, the male Red-breasted Merganser, ten Goosander, two Snipe, one Pintail, two Curlew, one Yellow-legged Gull, four Little Egrets, one Sand Martin, one Raven, one Green Sandpiper, 50 Fieldfares, ten Redwing, and finally, a Bittern from Stratford hide. Three Sand Martins were seen at Herriott's this morning. Our first of the spring, right on time. A male Common Scoter at the north end of the lake today was new-in. The other birds seen today were on a similar theme to recent days/weeks - two (male and female) Red-breasted Mergansers, male and female Greater Scaup, 22 Goosander, five Snipe, two Green Sandpipers, six Little Egrets, 24 Shelduck, five Mediterranean gulls and one each of Jack Snipe and Stonechat. 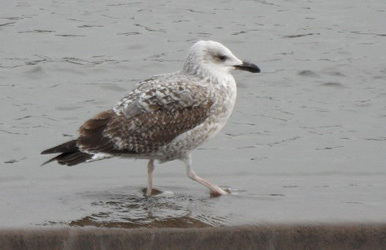 A first-winter Yellow-legged Gull at Herriott's overspill today. (Andy Davis).